Leading Moroccan businesswoman and president of the Moroccan Confederation of Businesses (CGEM), Meriem Chaqroun Bensaleh, took the stage at the G20 Summit in Hambourg along with Global business leaders at the launch event of the Women’s Entrepreneur Finance Initiative (We-Fi), a World Bank facility focused on promoting women’s entrepreneurship in developing countries. Invited by the World Bank President Jim Yong Kim, Bensalah Chaqroun represented the private sector at a high-level panel moderated by Canada’s Minister of Foreign Affairs Chrystia Freeland. During her talk, Bensalah-Chaqroun raised issues relating to the challenges facing women entrepreneurs notably in the MENA region and Africa where social obstacles and lack of access to capital hinder entrepreneurship. She also laid emphasis on the need for women to benefit from the momentum of the 4th industrial revolution. The billion-plus-dollar Women’s Entrepreneur Finance Initiative (We-Fi) will provide both financial and non-financial World Bank resources, including loans, technical assistance and guidance, mentorship opportunities, and policy reform to eliminate barriers for women in developing nations. Funding for the facility comes from both the public and private sectors, including international financial organizations, commercial financing foundations, private equity firms, and individuals. The ‘Women’s Entrepreneurship Finance Event’ was attended by many Presidents, heads of government, politicians, financiers and outstanding figures. 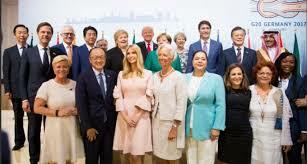 These included notably UN Secretary General Antonio Guterres, US President Donald Trump and his daughter and adviser Ivanka, South Korea’s President Moon Jae-in, German Chancellor Angela Merkel, the Prime Ministers of the UK, Australia, Japan, Canada, Norway, and the Netherlands, the IMF Director, among others. The participation of Meriem Bensalah-Chaqroun at such high-profile event is not the fruit of hazard. She has been distinguished by her leadership in Morocco and abroad and has been at the forefront of efforts to promote women empowerment and entrepreneurship. In 2013, she succeeded in taking the helm of the CGEM, thus becoming the first woman in the Arab World to hold such a position. Recently, she has acquired an international aura as one of the leading businesswoman in Africa starting with her leadership as Director of Eutelsat, a position which she had to leave last June after she was appointed Independent Board Director at Renault. Also mirroring her rising international profile, Meriem Chaqroun Bensaleh led the CGEM to win the UN’s Obersver status at the UN climate summit COP22 last November in Marrakech. Bensalah Chaqroun is also the Executive Director of Les Eaux Minérales d’Oulmès S.A, a leading company listed on the Stock Exchange of Casablanca, specialized in water and bottling. She is also Director of Holmarcom Group, one of the five largest industrial, commercial and financial groups of Morocco. Meriem obtained a diploma from the University of Paris Dauphine before getting her MBA from the University of Dallas. She serves on major institutions, among them, the National Central and Reserve Bank of Morocco, and SUEZ France. She is also Chairperson of the Euro-Mediterranean Center of Mediation and Arbitration. The 49-year-old mother of three is a licensed pilot, a Harley-Davidson rider, a race car driver, and a competitive golfer.